A new leaked image of the iPhone 7's rear camera module has been posted online today (via Nowhereelse.fr), bringing with it more concrete evidence that the 4.7-inch iPhone 7 will include optical image stabilization alongside its various other camera improvements. 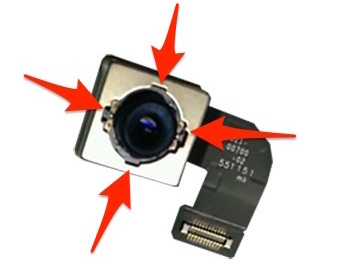 Previous reports surrounding the smaller-screen iPhone have hinted at the inclusion of image stabilization, but today's camera module leak provides the first visual hint of its addition into the upcoming 4.7-inch iPhone. The component in question includes four small cutouts surrounding the single-lens camera, housing the springs and equipment that allow for the lens to float slightly, leading to clearer, less blurry images. 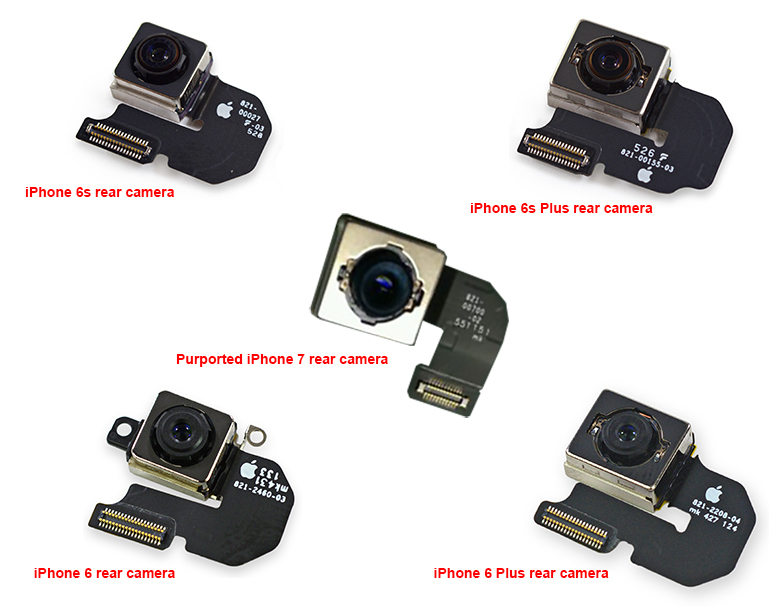 The same component for the iPhone 6 and iPhone 6s lack these cutouts. Since the iPhone 6 and iPhone 6 Plus in 2014, optical image stabilization has been limited to the "Plus" versions of Apple's smartphone, alongside features like better battery life. With optical image stabilization now believed to be coming to both the iPhone 7 and iPhone 7 Plus, the different camera abilities will be focused on the single-lens and dual-lens hardware for the 4.7-inch and 5.5-inch versions of the smartphone. Mockups over the last few months for both devices have shown larger camera bumps when compared to the iPhone 6s and iPhone 6s Plus, and the camera hardware in general has been believed to be one of the major selling points of an otherwise modest update year. Currently, it's believed that Apple will reveal the iPhone 7 at an event on September 7, and open up pre-orders on September 9. The specific launch date is a bit more ambiguous, with both September 16 and September 23 flagged as potential options. That's actually really good to hear. Ever since the 6 and 6 Plus were announced I've always felt like I should get the Plus just because of the better camera. Although the rumor mill is currently churning with talk of a dual camera on the Plus so I don't know. Ahhh Apple why must you force me to get that gargantuan phone just because I like to take good photos! As a casual, amateur, everyday person who takes only a few photos here and there, and are usually for utility purposes, I am simply amazed at the quality and tiny size of the camera's on the iPhone, and other phones too. I can only welcome additional improvements, like this, which make the photos I take just a little bit better. Very dissapointing that Apple still view the 4.7 incher as a sub-standard model, gimping its camera to upsell buyers to the dual lens on the Plus size. For many, a smaller iPhone with the best available camera would be even more valuable than the Plus size with the same camera. More portable means you're more likely to have it on you when shot opportunities arise. Just a WAG, but I'll bet Jony Ive is to blame for it. The 4.7 incher would need to be thicker to house the larger camera of the Plus size. That's really unfortunate since I don't remember anyone complaining about the thickness of the iPhone 5 or even the iPhone 4. When will Apple realize those of us buying the smaller phone is by our free will because we like that smaller one better?! Stop denying us the top spec stuffs. Take two years longer than the competition to introduce a feature? Come on, you know the Macrumors forum rules!! "If Apple is first, it's because they are pioneers. Everyone else will now copy." "If Apple is second, it's because others rushed to beat Apple whilst Apple are making sure it is done right first before it is released." That's actually really good to hear. I could not hear anything, I don't know where to plug my headphones! So next year the 4,7" model will get dual cameras? And in a couple of years it will get the awesome camera features from the next year's 5,5" and so on?